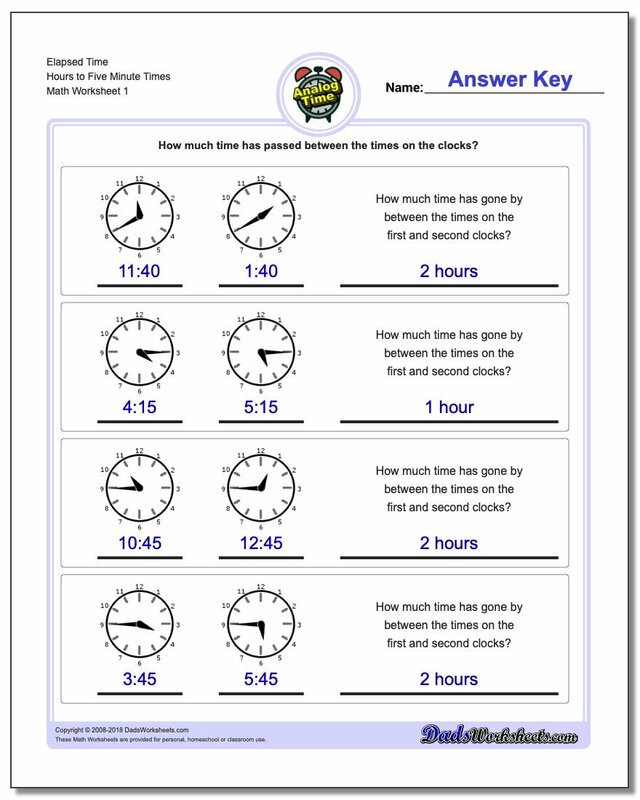 Each of the printable PDF elapsed time worksheets on this page includes an answer key with the time for each clock face as well as the actual time elapsed between the two values. 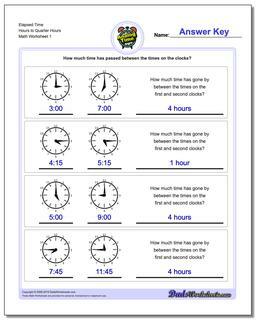 Elapsed time worksheets with times starting with a whole hour. Worksheets with problems computing elapsed times starting with a whole or half hour. Elapsed time worksheets starting from times on fifteen minute intervals. These Telling Time Worksheets to Teach How to Read Clock Faces! One of the strangest mechanical devices around is of course the analog clock. We see them everywhere because for so long they represented the pinacle of design and engineering. The miniaturization of the analog clock down to the wrist watch remains today a stunning achievment rivaled in many respects only by the microchip in it's expression of human ingenuity. Being able to tell time from an analog clock remains a skill that will have relevance well into the digital age, if for no other reason than the analog clock continues to represent a noble achievement whether it resides on a clock towner or on your wrist. Buyilding up to competency telling time requires a lot of practice, and these worksheets are here to help! Start with the worksheets that tell time on the whole hours, then progress through variations that deal with 15 minute intervals. Finally, work on telling time to the minutes to become completely comfortable with reading any position on the clock face. 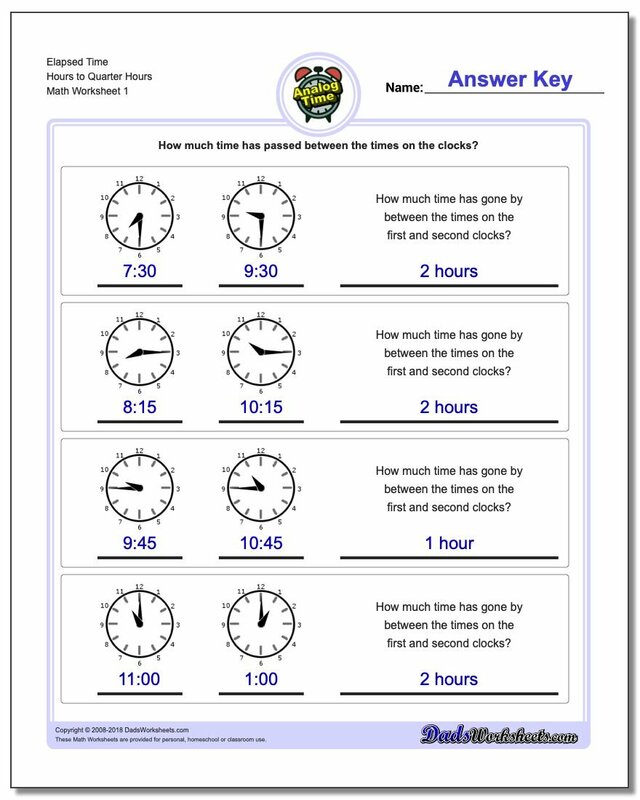 The time worksheets here include versions that require reading the clock face as well as drawing it in appropriately given a numeric time. You will also find versions that have clock faces with and without numbers. One of the most common types of time problems is being able to calculate the time a certain interval from now. This requires understanding how the hours can change as you cross the 60 minute (12 o'clock) boundary on the clock face. 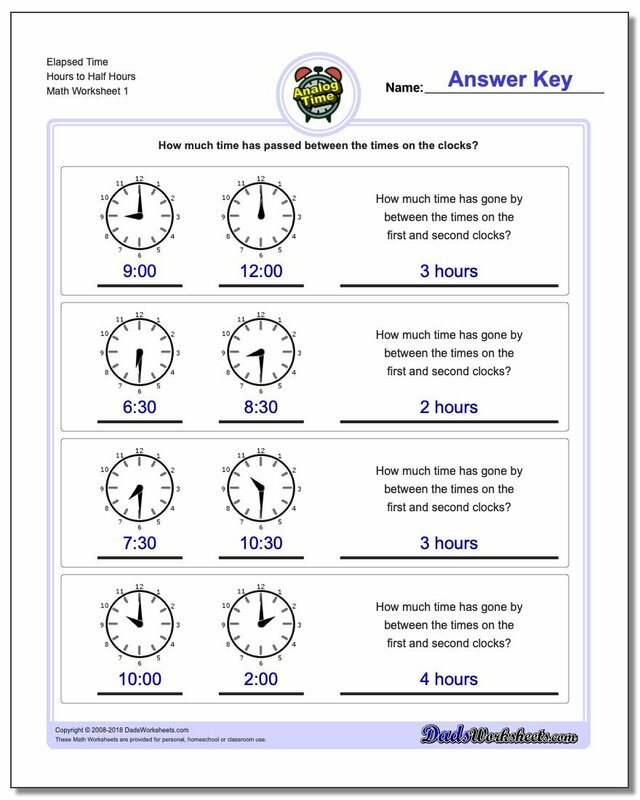 Like the other time worksheets on this page, the adding time worksheets start with simple tasks like adding a number of minutes to a whole hour and then proceed up through adding arbitrary minutes to times that do not cross hour boundaries, before presenting problems with calculated times that span hours.